The Romany Society was originally formed in 1946 and continued until 1965. It was re-founded in 1996, with Mr Terry Waite as Patron and Mrs Romany June Watt (Romany’s daughter) as President. It was created to promote and encourage the study and appreciation of the Reverend Bramwell Evens, better known as ‘Romany of the BBC’, who was a pioneer natural history broadcaster and nature writer. There are over 300 members of all ages. The Society has suffered some significant losses in the last few years: In 2015 our President Romany June died. There were obituaries in several papers including The Guardian and The Independent. The President role was taken on by Roly Bain, one of her sons. Roly was, like his grandfather Bramwell Evens, both a man of the church and a popular entertainer. He was one of the Holy Fools, a group of clowning ministers, rather than a broadcasting naturalist. Sadly, in 2016 Roly died, from cancer, aged 62. There have been a number of tributes to Roly in both press and radio, including the The Guardian, The Telegraph. The Times, and The Economist and the Radio 4 ‘Sunday’ . Roly’s brother Simon Bain, in Edinburgh, has indicated that he is willing to become President of the Society. Simon’s continuation of direct family interest is most welcome. Another stalwart of the Society, George Swalwell, also died in 2016. George, the real ‘Tim’ of the Out with Romany books, died in March aged 95. George first met Romany in about 1930 when Romany kept his vardo in the fields below the family farm at Eskdaleside, near Whitby. 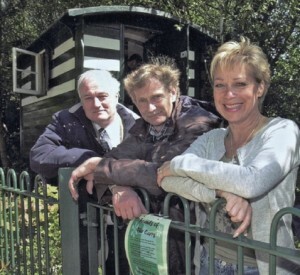 Visit our News page for details about a Commemoratve Edition of Romany in the Lanes dedicated to George. For reports on 2016 events and news about 2017 events visit our Events News page.